What does pizza taste like at 19,341 feet? Thanks to a record-breaking PR stunt from Pizza Hut Africa, a group in Tanzania now has the answer, CNNMoney reports. The pepperoni pie with extra cheese was delivered to the peak of Mount Kilimanjaro, the highest point in Africa, after a journey involving a plane, cars, and a team of professional hikers-turned-extreme-delivery-men. The first leg of the trek began on May 5 at Pizza Hut's new Dar es Salaam location in Tanzania, whose opening marks the chain's spread into 100 countries. 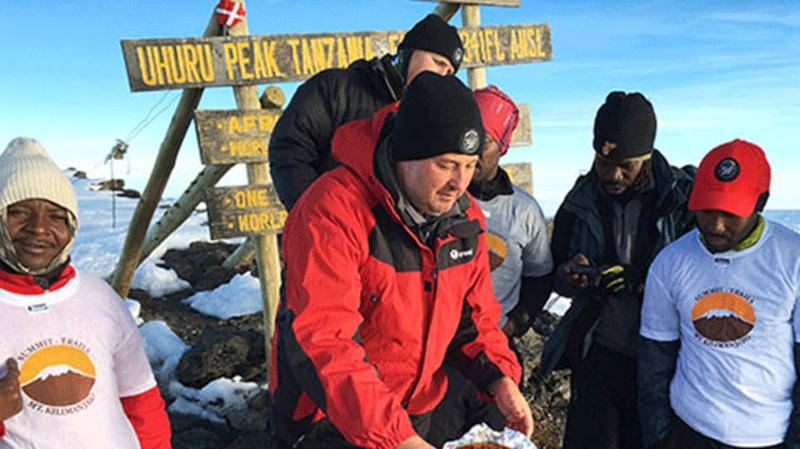 From there, the pie was flown from the local airport to Kilimanjaro International, driven to the base of the mountain, and delivered by five professional guides to a base camp at 16,000 feet. Waiting for them there was Pizza Hut Africa's general manager Randall Blackford and two of his colleagues. Together, they finished the hike to the top, breaking the Guinness World Record for highest elevation pizza delivery on land. In addition to claiming a new record, the achievement also helped raise money for the Msasani Primary School in Dar es Salaam. To keep the pizza preserved until it reached its destination, it was delivered in a specially-designed battery-heated pack that kept the box level during the hike. As for how it tasted at the end of its four-day delivery? "Nothing tasted as good as a pizza after hiking through the night," Blackford told CNNMoney. Hopefully they gave themselves a well-deserved tip.